Increasing the size of the head in more than one skull area can be done through either the application of large amounts of bone cements or a large custom skull implant. My preference today is to use a custom implant because the work of creating the dimensions of the skull augmentation needed, in both surface area coverage and thicknesses, is done before the surgery. This also ensures the smoothest augmentation surface with thin and non-visible or nonpalpable implant transitions to the surrounding skull surfaces. This may also allow for a slightly smaller incisional length to place it. 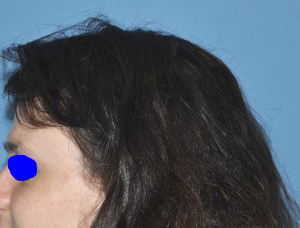 The key question in any large skull augmentation method, regardless of the implant material used, is whether there is enough scalp tissue to close over it. While the scalp will stretch when elevated from the bone, there are limits to its elasticity. One never wants to ‘discover’ during surgery after the skull implant is placed that the scalp cannot be brought together over it or the incisional closure is extremely tight. While there is no absolute implant thickness number that can be used to make that determination before surgery, my experience is that no more than 15mms of thickness over the most projecting portion of the implant should be attempted. 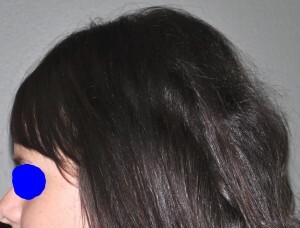 This thickness number may be slightly less or more in some patients based on the overall surface area coverage of the implant and the natural tightness/looseness of one’s scalp. 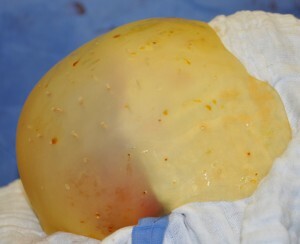 When scalp coverage over a large skull implant is a concern, a first stage scalp expansion needs to be done. A scalp tissue expander is initially placed and the patient does at home tissue inflations with saline until the expander volume is achieved. Usually this does not need to be more than 100 to 120mls of fill volume. The scalp tissue expander only needs to be inflated to the point that it creates the skull augmentation look that the patient desires. There is usually a six week time period between the placement of the tissue expander and the second stage skull implant placement. Compared to making the overall size and shape of the skull larger, reducing a large skull is both more challenging and less visibly successful. 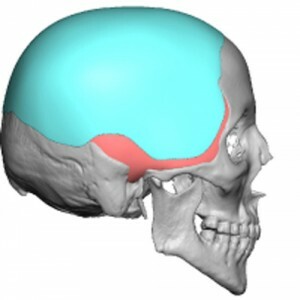 Safe skull reduction is limited to reducing/thinning of the outer table or cortex of the skull. This leaves the underlying diploic space and inner cortex of the skull intact. While this maintains solid protection of the brain, it also limits how much a skull can be visible reduced. Bone burring is the method used (not skull plate removal) and cannot be reduced more than about 5mm to 7mms on any given skull area. When done over a large skull area this can create a greater difference than that number alone suggests but the overall skull reduction is never going to be greater than about 10% to 15% of its overall size. Such skull reduction efforts require a long scalp incision to access as much of the skull as possible. © Copyright 2019 skullreshaping.com, rights reserved.